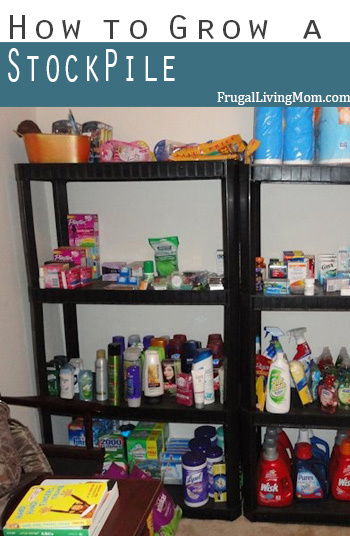 When some people think of a stockpile they tend to think a basement full of shelves and products that grossly resembles a super market or they think of products shoved under children’s bed, in the master closet, etc etc. Those are not normal stockpiles for most size families…. Let’s face it, your child doesn’t want a bunch of toilet paper and 2 Liter drinks stuck under their bed and your spouse doesn’t want boxes and boxes of products shoved in your closet. This is what most would call “extreme” and rightfully so. The exact definition of Stockpile is A large accumulated stock of goods or materials, esp. one held in reserve for use at a time of shortage or other emergency. A stockpile is based off of one principal, buy while the price is good so you save money later. For instance, if you use body wash and it’s on sale for free or $.50 cents you want to buy enough to last your family until the next sale. So when you run out of one bottle you have another on hand instead of going out and paying full price. This saves money in the long run and is the reason most couponers start a stockpile. Not only is it great for stocking up on great prices but also can be a HUGE blessing for your family when times get hard! Whether it’s a job loss, loss of other income or just the inability to go shopping for awhile. A stockpile can bless your family in many many ways. How long does it take to build a stockpile? This all depends on how you shop. Keep in mind that deals/sales rotate every few months so you do not need to put up for 5yrs worth of products, just enough until the item/deal is on sale again. Otherwise you run into the issue of products expiring before you’re able to actually use them. A decent stockpile can be built in just a few months, this going off the basis that you buy moderately and don’t “clear the shelves” by buying 20 of each product. I have never overbought or wiped out a store and trust me, my stockpile is well stocked and my family and I are well taken care of. You will find by buying a decent amount of sale products you can build your stockpile up rather quickly. Do I need to buy everything at once? No, this would cause shelf clearing which is a big no no for most couponers. You can purchase up to 5 of each product and still be stocked for a decent time depending on the size of your family and how much of each product you may use. And if it’s certain product you use a lot you can make a larger purchase, I always recommend stopping at two stores to do this or hitting the store once at the beginning of the sale and once at the end. This ensures you won’t wipe off all the products and still allows you to buy as many as you need. How do I know what amount is right for my family? This is different for everyone, I can’t honestly tell you how many of what your family may need. But you can look back at your purchases over the last few months and see what you bought a lot of, this will tell you what products you should really stock up on when it’s on sale. A good example from my family is we love Duke’s Mayonnaise, it’s the only mayonnaise I will buy. And while it is never free, I’ve bought it enough to know what a good price for it is. So when it goes on sale for the lowest price I typically buy 4 of them. This lasts my family about 3 to 4 months and at that time it is typically on sale again for me to restock. What does an actual stockpile look like? At the top of this post is a photo of my stockpile to give you a good example. I have two shelves in our spare room strictly for my stock. We have a rule/limit in my house that I will not exceed these two shelves. So when it starts to get full I have two options, give some products away or avoid buying any new sales/deals until my stock is used up some. I have stocked up on a lot of basics that my family uses such as body wash, shampoo/conditioner, dish detergent, laundry detergent and softener, razors, toothpaste, medicine, etc etc. These are products I know my family goes through so I have made sure to always have a decent amount of stock. Currently in this photo I have about a years worth of products for us, which means I don’t have to buy most of those items for a year. But I keep buying products, why? After slowly buying a few of each item during a sale I have built up a decent stock, which means when that item is on sale again I only need to buy one or two to keep my stock replenished. This helps not having to come out of pocket too much and also helps me not to stress about getting an item when it’s on sale and it being out of stock. If I go into the store right now to get a set of razors and they are out of stock I can still breath because I know I have enough on hand. What are some common items that are easy to stockpile? There are a few items you know you should always always get for free. Toothpaste, razors, Deodorant, Toothbrushes, Body wash, mustard, etc. These are products that are generally free at one point or another so when you see Toothpaste for $2 you know it’s not a good stock up price. I see people with Toilet paper in their stockpile, how? Toilet paper as you probably know is never free, it’s a product manufacturers know everyone has to buy. Most, including myself, actually use rewards we get back from other products to stock up on basics such as Toilet paper. So if you have $5 in rewards from one store and the next week there’s not really a good sale or anything you want to “roll” those rewards into you can use it to buy basic necessities such as toilet paper, paper towels, certain brands/products you like. How do I know when something is a good “stock up” price? You learn as you go along and start a stockpile what the best prices and deals are and when the best time to stock up is. Experience plays a big part in couponing and the longer you do it the more second nature it all becomes. For instance, I only like Viva paper towels. These are the only paper towels I like to use and I know from buying experience that they are never free. In fact the best deal I found was at Target for a large pack that included a free $5 Target Gift Card and I had a $2 off coupon. This was the best deal per roll on my paper towels so I stocked up. What do I do if I have too many products? This is very common when you first start coupon shopping to go a bit “overboard” until you realize how many products your family actually uses. Always consider donating items to help those in need, it’s a great feeling to bless someone else with all your hard work! Decide how you want to organize your stockpile. Do you want to use a spare closet, one shelf in the garage, etc. It’s your stockpile so don’t think you need to base it off what anyone else has.